Suria KLCC is a magnificent 6 level semi-circular shaped shopping mall built at the foot of the world's tallest twin tower. The shopping centre forms the base of the 88-storey Petronas Twin Towers located in the heart of the capital. Its unique design is to reflect the crescent on our Malaysian flag. It only makes perfect sense to have a commercial shopping centre where the biggest attractions are, right? Who says we are not enterprising? Come one come all! Having its doors officially opened on May 8th, 1998, this particular shopping mall has become one of the most visited places in the country. The word "suria" means sunshine in our native Bahasa Malaysia language. With one million square feet (93,000 square metres) of space, it welcomes over 653,000 visitors passing through the shopping centre each week. >Robinson & Co, the franchise holder for Marks & Spencer in Malaysia and Singapore, opened a 30,000 sq ft Marks & Spencer outlet in the new mall, its biggest in Malaysia. 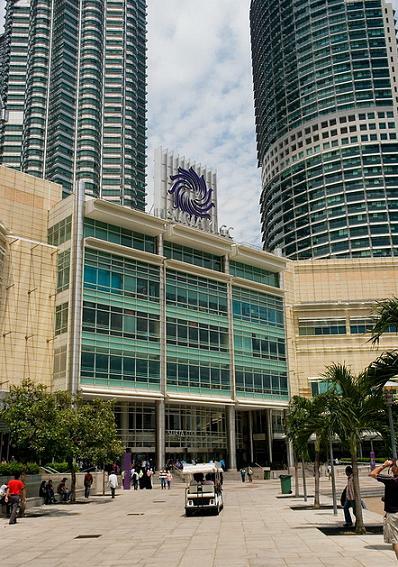 Other anchor tenants include Isetan and Amsteel Corp Bhd's Parkson Grand. Vendome Luxury Group Plc has also opened its Alfred Dunhill, Montblanc and Seeger outlets while the Melium Group offers boutiques such as Hugo Boss and Etienne Aigner. Together they form a group of 270 specialty stores. Scotts Picnic Food Court along with Tanjong Golden Village cinemas are the food and entertainment anchor respectively. Amongst the prominent features of the Suria KLCC Mall include a spacious centre court, natural lighting from skylight, landscaped walkways, amenities for the disabled and parent rooms, drop-off points, ample parking (5,000 bays), dedicated service tunnel, ample service lifts, and a crescent-shaped structure aimed at maximum storefront exposure. Address: Kuala Lumpur City Centre, 50088 Kuala Lumpur.